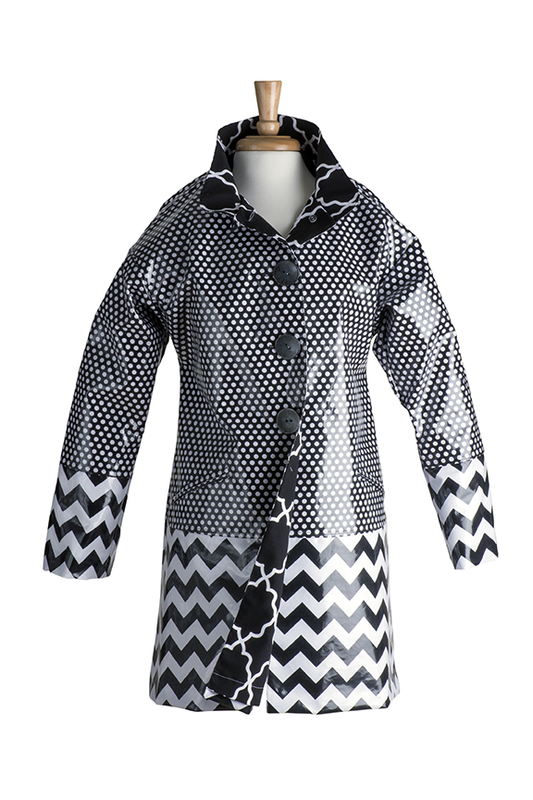 Lorene Drabo has been sewing almost since birth, and her Pour La Pluie line of rainwear for women and children offers great protection while also making a fashion statement. Named after the French phrase meaning “For the Rain”, Lorene’s trench-coat style rain jackets are made using cotton fabrics that have been overlaid with a semi-gloss laminate treatment, making them both water-repellant and breathable. A wide variety of printed and coordinated fabrics offer any sort of style, from sophisticated to flamboyant to whimsical – all with a classic tailored look. After being introduced to her craft for her grandmother, who had worked as a tailoress in Italy, Lorene later received textile and clothing degrees from Framingham State University and the University of Massachusetts. But more important is her lifelong unbridled enthusiasm for her work. The Pour la Pluie line also includes rain hats, women’s swing coats and tote bags, which are made using the same materials and with the same passion. Cast aside boring black or brown rainwear and try out Lorene’s work at a Sugarloaf Crafts Festival this season.